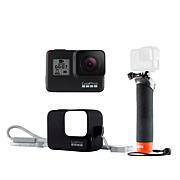 Relive your memories from your point of view for maximum impact. These full HD video-capture glasses from GoVision deliver engaging first-person point-of-view video and photos of everything you see. 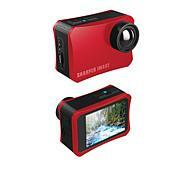 Capture incredible footage of downhill skiing, horseback riding, hiking, skateboarding and more. It records everything in vibrant full HD, or you can snap an 8MP still photo. 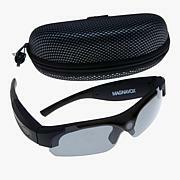 They're comfy, sweat resistant and come with 2 sets of lenses for indoor and outdoor use. Put your viewer in the driver's seat with GoVision! Images are fairly sharp and or very good color. 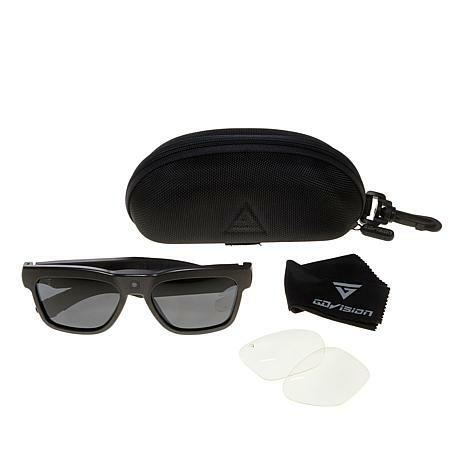 This pair of GoVision camera glasses has polarized sun lenses instead of standard dark sun protective lenses. The set of clear lenses also provided is a nice feature. My negative feelings only stem from the charge time of 1.5 hours and only one hour recording time. 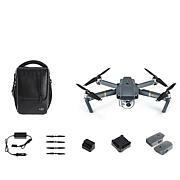 Needs more battery power and recording time. Have not been able to get it to work at all. We have charged it to no avail. WARNING WILLL NOT LAST !!!!!!!!!! Loved these when I first got them worked well up until yesterday. Yesterday the button to turn on video will not work. Seems for the price I paid these should last longer then one and a half months. To late to return but thought I needed to warn others not to buy.